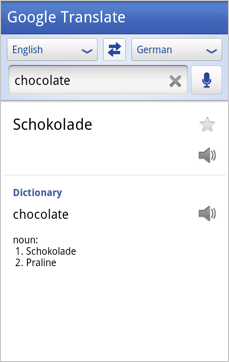 When we launched the first version of Google Translate for Android in January 2010, we were excited about the year ahead. For the first time, we were bringing the capabilities supported on Google Translate—like machine translation, romanization of non-Roman scripts and spoken translations—to the Android platform. We also offered voice input to let you speak the word or phrase you wanted to translate instead of typing it in, and SMS translation so you could translate SMS messages sent to you in foreign languages. Today, we’re refreshing Translate for Android with several updates to make the app easier to interact with. Among other improvements, we’ve created better dropdown boxes to help select the languages you want to translate from and into, an improved input box, and cleaner icons and layout. We also want to let you in on an experimental feature that’s still in its earliest stages—Conversation Mode. This is a new interface within Google Translate that’s optimized to allow you to communicate fluidly with a nearby person in another language. You may have seen an early demo a few months ago, and today you can try it yourself on your Android device. 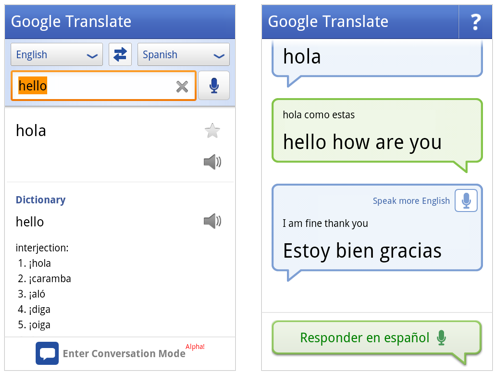 Currently, you can only use Conversation Mode when translating between English and Spanish. In conversation mode, simply press the microphone for your language and start speaking. Google Translate will translate your speech and read the translation out loud. Your conversation partner can then respond in their language, and you’ll hear the translation spoken back to you. Because this technology is still in alpha, factors like regional accents, background noise or rapid speech may make it difficult to understand what you’re saying. Even with these caveats, we’re excited about the future promise of this technology to be able to help people connect across languages. As Android devices have spread across the globe, we’ve seen Translate for Android used all over. The majority of our usage now comes from outside the United States, and we’ve seen daily usage from more than 150 countries, from Malaysia to Mexico to Mozambique. It’s really rewarding for us to see how this new platform is helping us break down language barriers the world over. Translate supports 53 languages, from Afrikaans to Yiddish, and voice input for 15 languages. 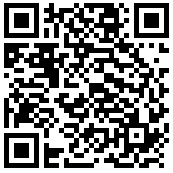 You can download the application, available for devices running Android 2.1 and above, by searching for “Google Translate” in Android Market or by scanning the QR Code below.